Okay - gonna make this one really easy! This is the same recipe that I posted yesterday for Watermelon Lemonade. A few of you wrote and told me that you made it and loved it. 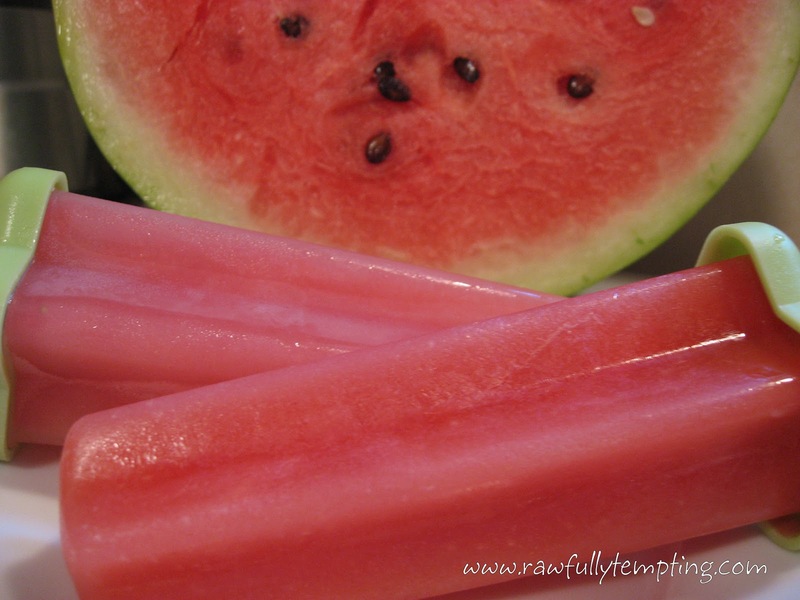 I had some extra and poured it into my ice pop molds...and here we have delicious, refreshing, wonderfully scrumptious Watermelon Lemonade Ice Pops!!! Enjoy! Fill blender 3/4 full with chunks of watermelon. Remove the seeds. PULSE a few times in the blender and pour through a strainer to remove any seeds that got in there. Put juice and pulp back in blender and add lemon juice. Blend well. Add ice and blend again, until smooth. You can add some strawberries, blueberries, bananas, whatever you like. Pour into ice pop molds. Enjoy this delicious summer snack! You could also blend in some greens for a lovely and fruity green smoothie, which you could also freeze into pops.. This sounds amazing! Need to get some pop molds! Love the look of those Ive made these a few times this summer,going to try the lemon,have been using lime...Soo refreshing!! Where did you get your molds from,all ive seen is the short an stumpy looking ones,these look great!! Even better than the basic watermelon lemonade recipe. Where can I buy the same Ice Pop Molds you show? For molds you can click on the RAWmazon Tab on my blog and Go Directly to the Amazon Store - look under Gadgets - You'll see two different options there. Both work great!